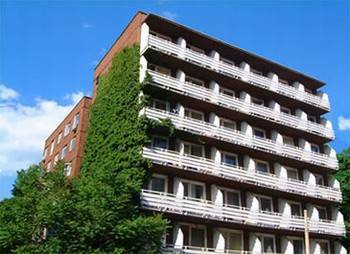 Description: Location: Leslie Suites is on the Pest side of the city, only a few minutes by foot from Budapest's centre and from the bank of the Danube. 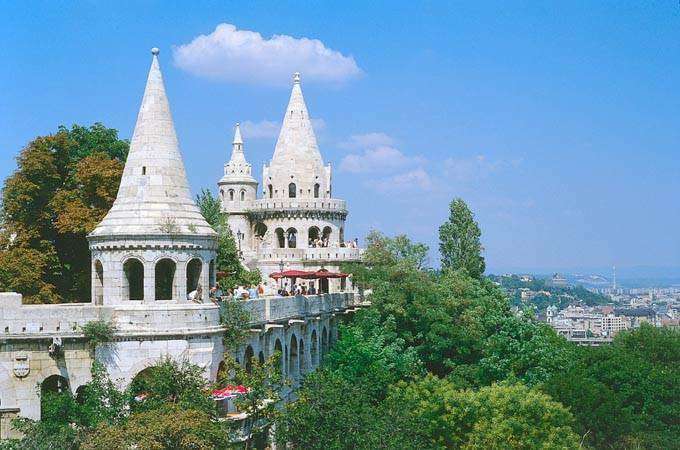 Its central location and the proximity of nearby public transportation hubs means that the city's main tourist attractions (Parlament / Parliament, Hõsök Tere / Heroes Square, Budai vár / Buda Castle, Váci utca / Váci street, Városliget / City Park, etc.) are easily accessible. Trolley bus 76 stops right in front of the building's main entrance, bus 15 is 100 metres (~110 yards), the underground (M2) is 400 metres (~440 yards), and trams 4 and 6 of the city's main boulevard are 800 metres (~875 yards) from the building, so getting around via the public transport system is a breeze. There are a number of entertainment, leisure, and sport venues nearby. A variety of great restaurants are within a 500 metre (~550 yard) radius and Central Europe's largest shopping centre, Westend City Center is also nearby. 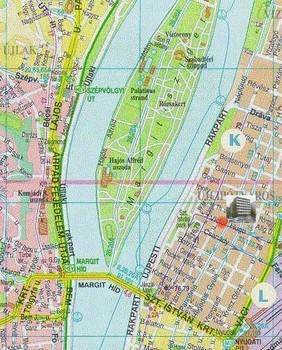 A 10 minute walk will take you to Margitsziget (Margaret Island), which features a special 5 km (3. 1 mile) running path, tennis courts, and a year-round swimming pool. 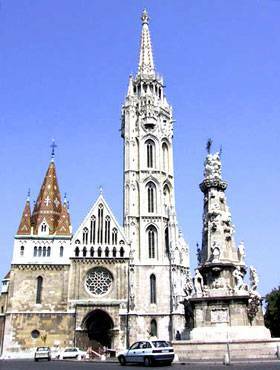 A 15-20 minute trip will take you to Budapest's famous baths (Széchenyi, Császár, Lukács, Király, Gellért). 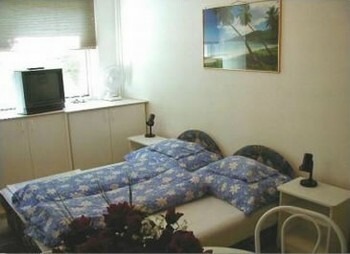 Accommodation: 30 double and triple studio flats accommodate up to 65 people at any one time. The 20 square metre (215 square foot) air-conditioned suites include shower cabins, toilets, safe, internet access, satellite television, a small kitchen with electric cooktop, refrigerator, microwave, hairdryer. A few suites also have balconies. 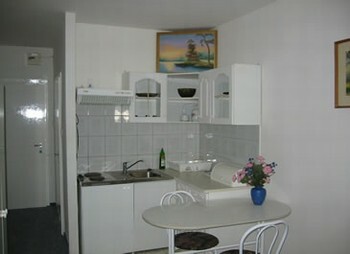 Upon arrival, guests are greeted with ice-cold complimentary mineral water in the refrigerator. The fee includes a continental breakfast, which guests can enjoy in our breakfast lounge or, upon request, in their room. Additional services: 24 hour reception, non-smoking suites, shared washer with ironing and drying space, internet room, faxing, pets are allowed for a 10 Euro/night additional fee, and two lifts. Parking: Guests who arrive by car can park in the buildings own, closed car park for 5 Euro/car/night, and in the nearby multi-storey car parks for 15-20 Euro/car/night. At time of Hungaroring /FORMULA I./ and at Christmas time and New Year Eve prices will be different. You can take your pets with you, too! How to get to our Apartments? From the Airport by Airport Minibus (costs 2300 HUF per person ), or by public transport : take bus nr. 200 and go as far as Kobánya Kispest (last stop), get on the blue metro line (M3) and go 13 stops to Lehel tér in Újpest direction. At Lehel tér take the exit Victor Hugo str. and after a 2 minute-walk we welcome you in our Apartments. From downtown take the blue metro line (M3) and go 2 stops as far as Lehel tér in Újpest direction. At Lehel tér take the exit Victor Hugo str. and after a 2 minute-walk we welcome you in our Apartments. From Eastern Railwaystation (Keleti pu) take the red metro line (M2) and go 3 stops to Deák tér (direction Déli pu) get on the blue metro line (M3) and go 3 stops as far as Lehel tér in Újpest direction. At Lehel tér take the exit Victor Hugo str. and after a 2 minute-walk we welcome you in our Apartments. The cheapest taxi you can take from the airport (Zona taxi) costs about 22 EUR/car. Discounts are available for groups. One group is minimum 15 people. Children under 2 are free to stay in the same room with the parents without extra bed.